The upper surface is concentrically zoned and hairy when young. The zones are grooved and vary in color in shades of gray and brownish-gray. It soon becomes gray and hairless. The margin is whitish and velvety on actively growing conks. The underside is whitish. The pore tubes are not layered (stratified). The flesh is hard and cinnamon brown. When cut in cross section there are no white lines (mycelial threads) visible. An individual conk can survive for years, even decades, forming a new ridge or furrow each year. It is found on standing or fallen dead trees or on the trunk of a living tree. 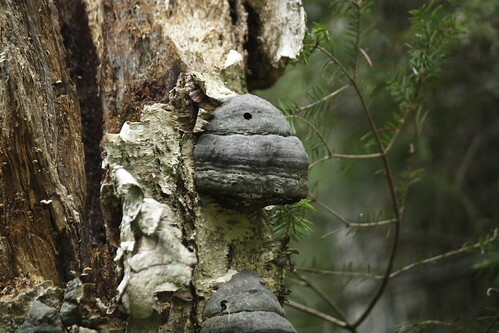 False Tinder Fungus (Phellinus igniarius) old conks are black and often cracked above. The margin and undersurface are light brown and velvety on actively growing conks. The pores are stratified. The flesh in cross section shows white mycelial threads. True Tinder Polypore gets its name from its most common usage, as tinder for starting fires. Otzi the Iceman, the 5,000-year-old mummy found in the Alps in 1991, was carrying four pieces of it. Photographed at the Rydell NWR, Minnesota (03 June 2012). There is proof that prehistoric peoples used this mushroom to start fire with, and carry fire in. Tradd discuss this mushroom in the Pisgah national Forest. In clipurile mele despre ciuperci veti intalni cateva sute de specii de ciuperci si bureti. Unele ciupercisunt comestibile, altele necomestibile, toxice, halucinogene sau mortale. Foarte multe clipuri infatiseaza ciuperci medicinale, in special, imunomodulatoare, anticancerigene, antioxidante etc. O parte dintre clipuri prezinta si ciuperci cu o descriere completa, necesara pentru identificare si utilizare. Atentie! Exista si ciuperci de padure a caror identificare este nesigura sau doar in lucru. Pentru orice fel de informatie, va rog sa lasati mesaj. Google Translate: My Videos about mushrooms you will find hundreds of species of fungi and sponges. Some edible ciupercisunt other inedible, toxic, hallucinogenic or fatal. Many videos depict medicinal mushrooms, in particular, immunomodulatory, anticancer, antioxidant etc. Some of the clips shows and fungi with a complete description, required to identify and use. Please note! There are wild mushrooms whose identification is insecure or just working. For any information, please leave message.